- Made of High Speed Steel. Knurls are individually cut to obtain Sharp, perfectly formed teeth. Heat treated, Tempered. Available in C.S., H.S., H.S.S. 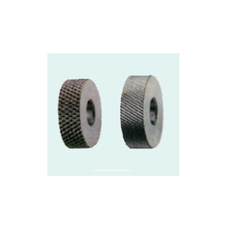 Backed by rich industry experience, we are engaged in providing a premium quality range of Knurled Components. These are made in 2 grades I.e H.S & C.S. Holes of these Knurls are made concentric to ensure uniform and clear results. Available in HSS, HS and CS with Coarse Fine Medium in Straight, Right, Left. Perfectly Hardened and tempered withBest Quality. - made of high speed steel. - knurls are individually cut to obtain sharp, perfectly formed teeth.